Why the Organ Donor Registry Is More Than a Sticker on Your License | Gary G. Abud, Jr. This entry was posted in Community Michigan and tagged Donate Life Gift of Life Michigan Michigan Michigan Eye Bank Organ Donor Registry Secretary of State on April 2, 2014 by Gary G Abud Jr.
Nearly 20 years ago, while sitting in my 5th grade math class, I was having trouble seeing the board. I squinted instinctively with each eye separately, and then with both together, before I finally managed to bring the writing on the board into focus. I didn’t think much of it at the time, but others took notice. When we lined up at the door to make our way to the next class, my teacher asked me to stay back and chat for a minute. She not only saw me squinting, but she knew exactly what was going on. She asked me if I was having trouble seeing the board and I said, “yes.” That moment changed the course of the rest of my life. The teacher contacted my parents to let them know that I was having trouble seeing the board. Before I knew it, I was in the exam chair of an ophthalmologist’s office waiting to get my eyes checked. I remember reading letters off of the infamous vision chart and reproducing my habitual squint through a number of other sight tests before the doctor gave me her conclusion: Keratoconus. Kera…what? Not just run-of-the-mill myopia or astigmatism like many children have, but Keratoconus, an uncommon disease of the cornea—the tissue that makes up the clear front “window” over the eye. As the doctor went on to explain, with Keratoconus the cells of the cornea, which are normally tightly interconnected, begin to lose their connective integrity and the entire tissue deteriorates. The result: a cornea that is thinner than normal and bulges out into a cone shape, rather than maintaining the normal round contour of the eye. Because the cornea is the first filter through which light passes when entering the eye, a misshapen cornea distorts vision in several ways all at once. The impact of Keratoconus on my vision could not be simply described in words. Fortunately, some talented photographers at KCVision created a gallery of images in which you can see images the way that a Keratoconus patient sees the entire world. Courtesy of the KCVision folks, I put together this presentation to explain and show Keratoconus to others, revealing how I saw the world with the condition. When I was first diagnosed with Keratoconus, the condition was mild and its effects could be corrected with a strong prescription for glasses. While going through middle school with “Coke bottle” glasses didn’t help my social life all that much, it did help me see better. When I reached high school however, the Keratoconus had advanced to the point that glasses no longer helped. The more progressive treatment was to issue me special hard contact lenses, which were made of a rigid plastic. The idea of these contacts was that they would serve a mechanical function to reshape my corneas and improve my sight—they did just that. Throughout high school and early college, I wore these special hard contact lenses to correct my vision. With them, I was able to read sheet music for piano, play tennis, read and drive just like most everyone else my age. Though hard contact lenses aren’t the most comfortable thing to put in your eye, they did the trick and helped improve my sight. As the condition continued to progress, it eventually reached the point during my college years that the contact lenses no longer made a difference. As a college student who went to a commuter university, realizing that I was no longer able to effectively see well enough to drive or read quickly took the wind out of my sails. That’s when the ophthalmologist recommended me for cornea transplant surgery. I had never heard of this operation before, though I was familiar with other transplant surgeries. After scheduling the operation with the surgeon, I researched the procedure and the entire process. That’s when I learned about the Donate Life program and the work of two outstanding organizations: Gift of Life Michigan and the Michigan Eye Bank. Unlike some organs and tissues, for example a kidney, corneas can only be donated once an individual passes away. Learning that my cornea transplant was going have a direct connection to someone’s loss was a powerful experience for me. Immediately, I realized the seriousness of my condition, the transplant surgery, and the process of organ and tissue donation. After undergoing my first cornea transplant almost seven years ago, I can still remember the exact moment when the surgeon first took the bandage off and asked me to open my eye. I could see! Not only could I see better, I could see perfectly—20/20. It was a miracle! I remember looking around the room in awe that I could make out facial features of the people in the room, including my wife and the surgeon, as well as details of all the instruments and the texturing of the wallpaper and floor. All at once, I was reveling in this joyous moment of having my sight restored while a family somewhere else was mourning the loss of a loved one. It’s tough to describe all the feelings, even to this day, but I remember being extremely grateful for this gift and also inspired by the challenging decision that was made to donate life by a complete stranger. I reached out to the family of the cornea donor through the Michigan Eye Bank and sent a letter to express my gratitude. Words cannot describe what it means to be connected to someone else in that way; however, it is a feeling that motivates you to make the most of the opportunity in your life from what you were given. To my surprise, I received a letter back from the family of the donor. The mother of three boys wrote to me and explained how her 17-year-old son had a fatal seizure. In the letter, she explained how hard it was to make the decision to donate life, but that their family decided that they wanted to turn this tragedy into hope for others. Through their decision to donate life, they did just that—created hope where there was seemingly none for me. Included with the letter was a photo of the high school student from Illinois who had passed away. The mother noted in her letter to me that her son, Jared, had remarkable eyes, which was evident by the photograph she included, and how glad she was to hear that his eyes could give someone else their sight. By choosing to donate life, this family had given me much more than sight. They gave me hope and a future. From that day forward, I promised that I would do everything I could to give back to others in a way that honored Jared’s donation. Without that gift of sight, that donation of life, I wouldn’t have finished college. I would not have gone on to graduate school. I wouldn’t have conducted medical research, taught high school students science in two states, got married, see my little girl, or received the honor of being the 2014 Michigan Teacher of the Year. Over my career, I have impacted the lives of hundreds of students and worked with thousands of educators all over the U.S. Each one of those educators, in turn, works with hundreds of students. The effect and magnitude of donating life is incredible. Again, this would not have been possible without the gift of organ and tissue donation. Jared’s gift and his family’s decision to donate life not only impacted my life, but also touched the lives of thousands more. Every day I am grateful to Jared and his family for having donated life. 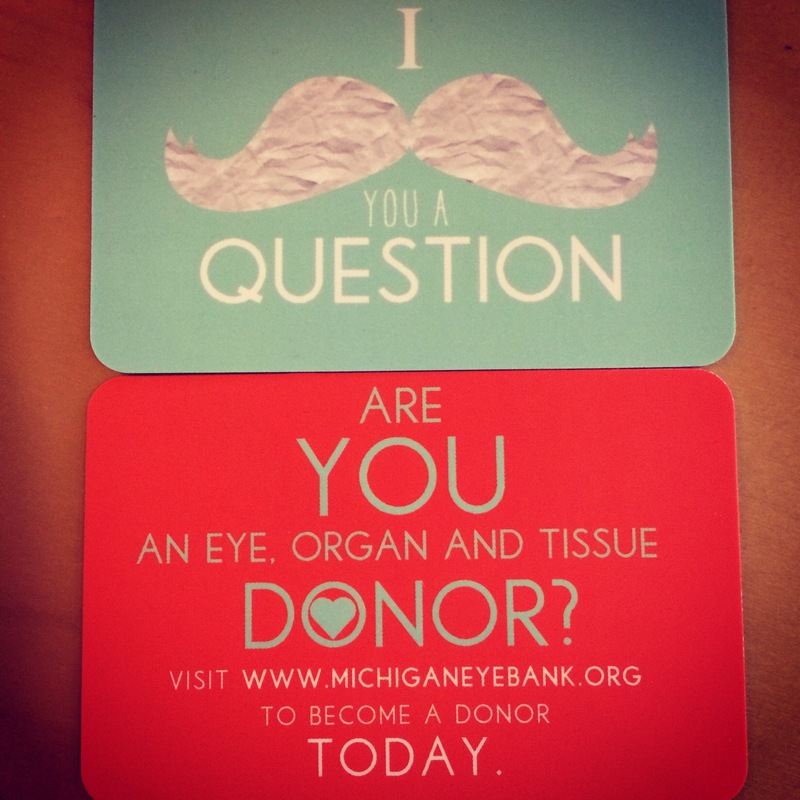 It has motivated me to become an Ambassador for Sight with the Michigan Eye Bank, raise awareness of the organ donor registry, and join the organ donor registry myself. Now, that sticker on the back of my driver’s license has become a badge of honor to know that one day I could help others just like Jared—he’s an inspiration. April has been proclaimed National Donate Life Month. The gift of organ and tissue donation can have a lasting impact on the world in ways that we, as individuals, could not even begin to comprehend. 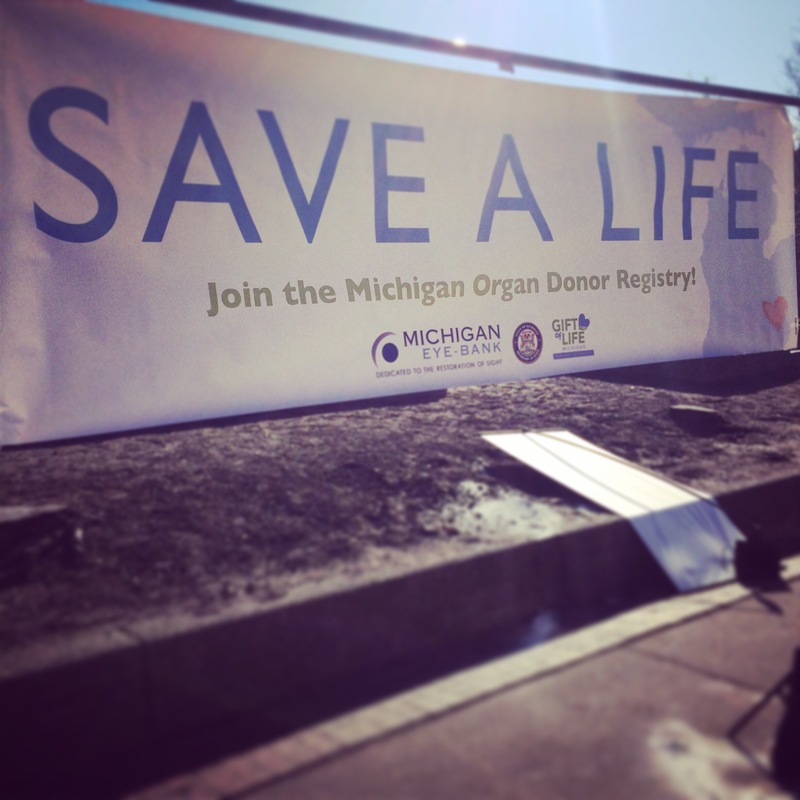 I am honored, inspired, and committed to promoting the work of the organ donor registry here in Michigan and beyond. That’s why on April 2, 2014 I will be sharing my story, in honor of Jared, with the Michigan Secretary of State and the Michigan Eye Bank at Wayne State University in Detroit to kickoff Donate Life Month 2014. Image Credit: Alex Teska, Michigan Eye Bank, and Gary G. Abud, Jr.